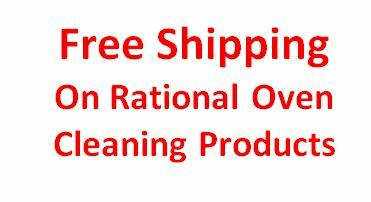 Want Free Shipping on Rational Cleaning Products? One of the most important aspects for any company is offering customers what they need and what they want. At AC Services (Southern) we pride ourselves on our service and our commitment to our clients in pre-empting problems through our service packages. However, there is also the issue of consumable sales. Again, we are proud of the accessibility of our online presence in offering accessories and cleaning products. Much as we enjoy hitting the road to visit our customers, having an online shop is essential. Our aim, as always is to maintain the highest levels of customer service. Customer service is usually defined as the act of ensuring customer satisfaction through product and/or services and we strongly believe in the old adage, ‘people buy people’. We are renowned not only for our efficiency, but also for our attitude. Although online sales may appear simply impersonal transactions, we still want to maintain the personal touch. This is why we promote as many deals as possible. For instance, you can take advantage of our flat shipping rate with a £12.50 discount when used in conjunction with the code freeship. NB other charges may apply for bulk or non-mainland UK shipping . We have introduced this deal because we are aware that we may not appear the cheapest for the Rational cleaning product you need when it comes to shipping products that fall into the hazardous goods shipment bracket. This is wholly because we use a flat rate cost contribution to shipping rather than reduce the headline cost of the product and ramp up the delivery cost. Besides, an online sales presence is often time-saving not just for the customer but also for us. It takes no time at all to enter an order and wait for the despatch of the goods. For us, a last-minute Friday morning order for stock from a customer who hasn’t realised the extent to which stocks have dwindled could save us an emergency dash up the M5 (in rush hour, on a Friday, on the day the school holidays begin). AC Services provides a full range of Rational cleaning products targeted at ensuring long-term care as a key to lifetime performance of your oven. Remember, if you have more than one Rational oven, then you may need different cleaning product combinations. Rational Oven Cleaner Tab (x100): highly concentrated tablets specially developed. A new complex set of active ingredients designed to guarantee maximum cleaning power. Rational Oven Care Tablets (x150) with special scale-dissolving ingredients contained to prevent limescale building up. They give reliability without a water softener and the need for time-consuming descaling. Rational Rinse Tablets (x50) highly effective care products ensuring active protection. Rational Grill Cleaner (10 litres) for use with a hand spray gun. Rational Rinse Aid (10 litres). For water filtration, the products are the Brita Purity 1200 Quell ST Filter Cartridge or the 600 Quell ST Filter Cartridge. To order your Rational cleaning products, simply go to our online shop. Don’t forget to use the coupon code freeship valid until 28th September. Or call us on 01454 322222 for more advice.